This luncheon will include an interactive program with Paul fielding questions from the audience and answering them using his treasure trove of charts and graphs. Bring your questions about the economy in general, or specific questions on housing, tourism, construction, and more. All questions welcomed! Be prepared for a lively and informative program. Paul is widely regarded for his 25 years of research and insights into Hawaii’s economy. He has a Ph.D. in economics from the University of Hawaii at Manoa and a bachelor’s degree in economics from Stanford University. Paul also performed graduate work in economics at the University of Wisconsin-Madison. Hawaii is 12th* in the nation for the most startup activity. What is a startup company, and what is the basic entrepreneurial process of taking an idea, and planning, funding, and launching a new business? What is the Entrepreneur EcoSystem in Hawaii? How does the growth in available Venture Accelerators in Hawaii benefit startups, and how does this promote economic growth and diversification? Honolulu’s Chinatown is an energetic and dynamic community. Home to the Hawaii Theater and monthly First Friday festivities, Chinatown is a distinctive blend of art galleries, restaurants, and boutiques, and merchants selling an array of products including fresh produce, seafood, herbs, leis and flowers, and household goods. 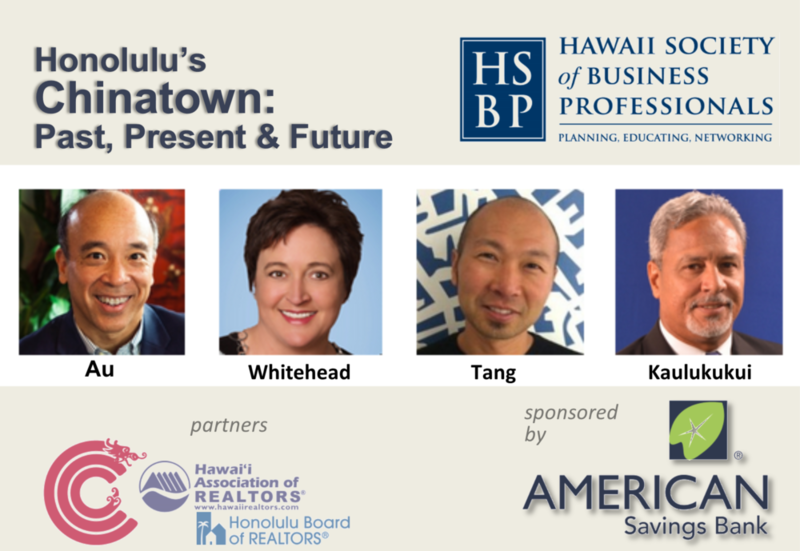 Our panel will share their perspectives on Honolulu’s Chinatown – it's history, how it compares to Chinatowns in other communities, and future development, including development in connection with Honolulu Rail Transit and the priorities from the recent Chinatown Action Summit. Guy Kaulukukui is the newly appointed Director of the Department of Enterprise Services for the City and County of Honolulu. He leads the operation of the City’s revenue generating activities including Blaisdell Center, Waikiki Shell, Honolulu Zoo, municipal golf courses and all of the city concessions. He has a bachelor’s degree in economics from the University of Hawaii, an MBA from Hawaii Pacific University and a Ph.D. from the University of Kansas. Andrew Y. K. Tang is a Senior Transit Oriented Development (TOD) Planner with the City and County of Honolulu Department of Planning and Permitting. Born in Hong Kong and raised in Honolulu, Andrew studied in Chicago, and has worked all over the world contributing to innovative and challenging projects in the field of Architecture & Urban Design. Andrew has resided in Chinatown for the past 3 years and is an active community member. Jeff Au’s great-grandfather (CQ Yee Hop) started one of the first markets in Chinatown, and his family still owns the building on the same property. Although he does not have direct involvement in the family business, Honolulu’s Chinatown has been an important part of his history. He has visited Chinatowns in the US, Canada, Europe and Asia. In his “day job,” he is a co-founder and Managing Director of PACIFICAP, Hawaii's largest locally based venture capital investment firm. Beth Whitehead is Executive Vice President and Chief Administrative Officer for American Savings Bank. She oversees a wide range of functions including Human Resources, Learning and Development, Community Advancement, Corporate Communications, Corporate Real Estate and Facilities, Legal, Compliance, Corporate Security and Community Reinvestment Act (CRA) activities.